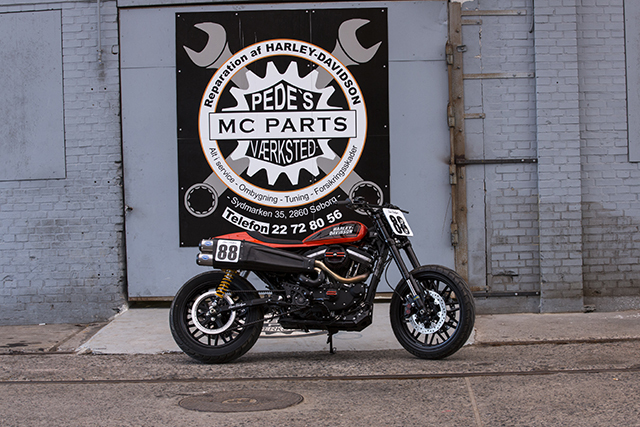 “So we went out and bought a 2017 Sportster Roadster for him straight away” says Maki from MC Parts. Luckily the bike already had some design elements that would make their job easier and retain that factory look they were going for. 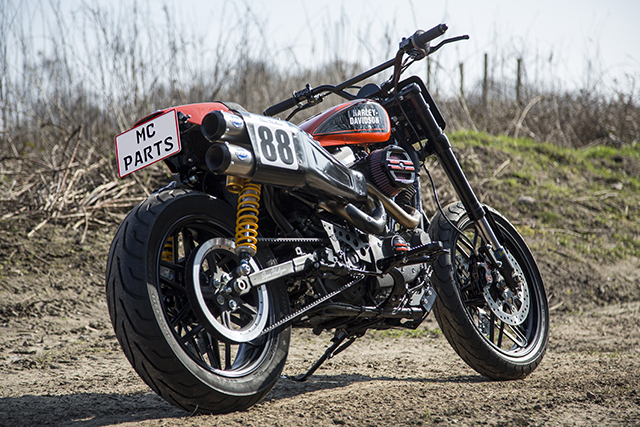 “The wheels with the reasonably “open” spoke design and the competent Showa USD forks with dual discs.” The front fender was ditched and instead custom fork leg covers were crafted. 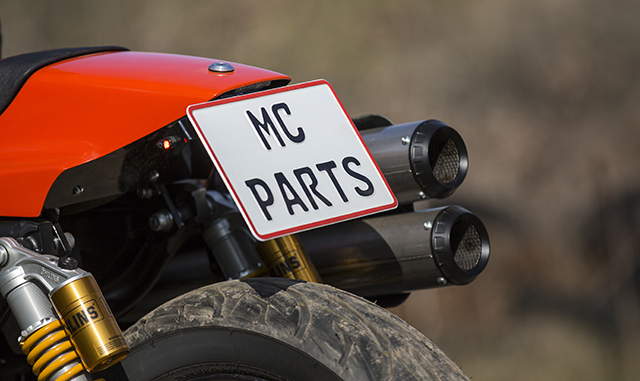 The tank was the first thing the guys at MC Parts sourced, as the entire project was pretty much built around it. 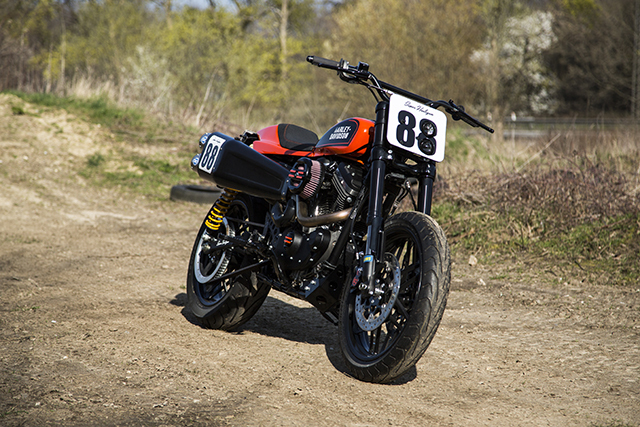 After looking at 4 or 5 tanks they finally choice this 7 litre beauty that resembled the original XR750 tank the most. Because of its small size and its low profile they opted for an external fuel pump in the tail section. “One thing we agreed on very early in the project, was that a continuous line from the bottom of the tank to the fiberglass tail” says Maki. 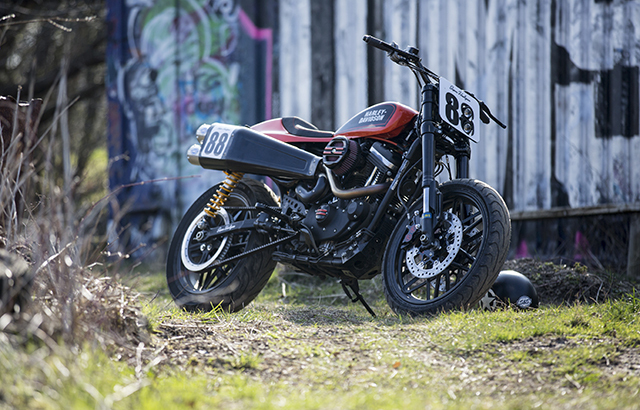 “It would make for a very harmonic silhouette, especially when comparing it to many other sportster flat track bikes that almost without an exception have a step down from the tank to the seat. The final position of the tank and the seat was the only place where we could get acceptable clearance from the rear wheel, while maintaining a decent seat height (850mm)”. 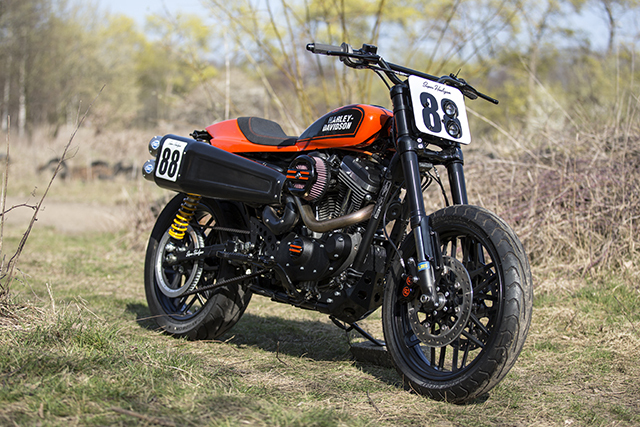 The tail section is a fiberglass unit, with a classic custom seat that has orange stitching to match the paint job. Under the fiberglass is a bracket that holds things like a can switch box, the fuel pump and a fuel pressure regulator from a Ducati. The heavy stock brake calipers were swapped out for dual 4pot Performance machine units, in a differential bore design. 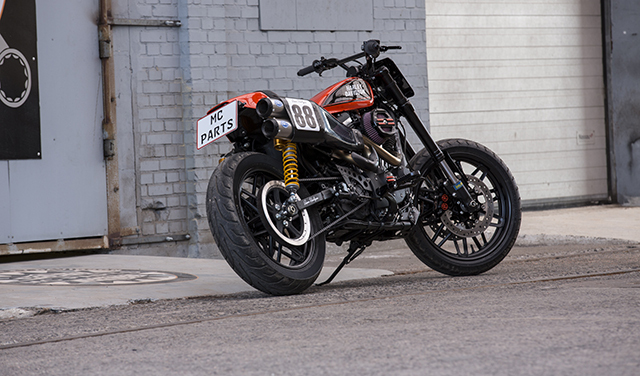 At first MC Parts were thinking about using the DT3 tires from the new Indian FTR1200, but at the last moment they decided to keep the stock Dunlops. 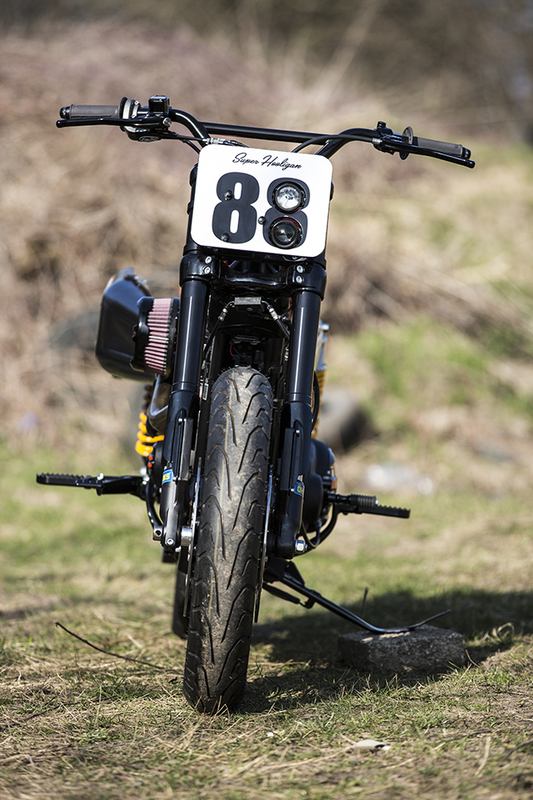 The number “88” front plate has a dual HID headlight unit, hidden in one of the numbers. All lights and license plate bracket with the extremely small Kellermann rear lights with indicators, can be completely removed for track use in about an hour. 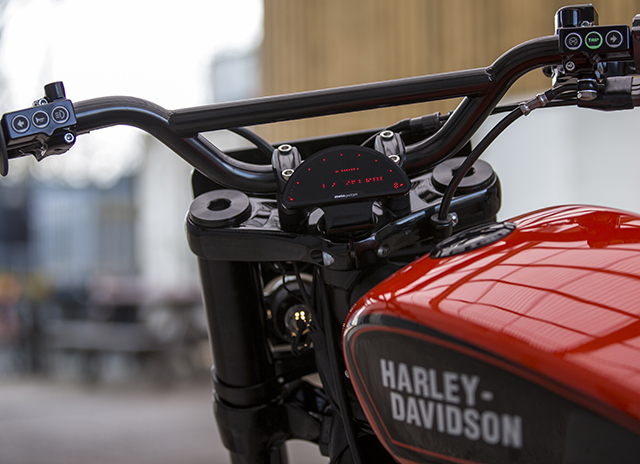 Handlebars are from Biltwell in a moto-x bend with a cross bar, perfect for urban riding which is where this bike will probably be ridden the most. Riding position is upright and relaxed. 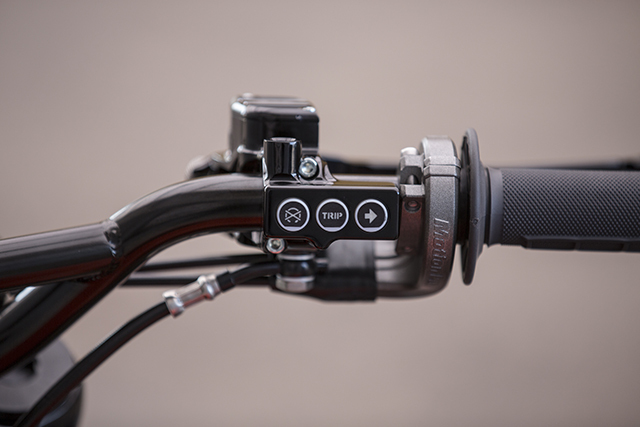 We went with Renthal grips and bar end indicator lights and the throttle unit is from Motion Pro. 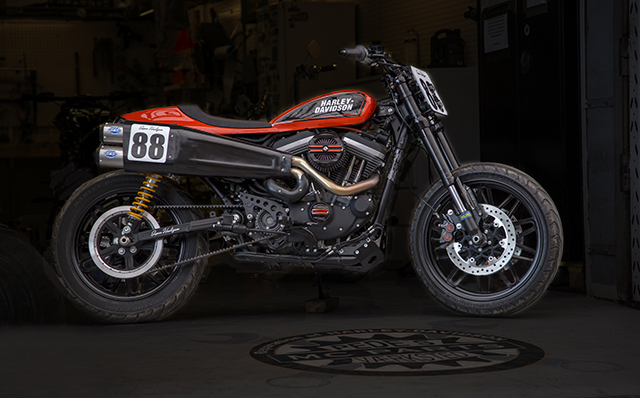 With the RSD Super Hooligan racing drawing so much attention and crowds in the USA, we are sure we will be seeing more of these larger capacity street legal flat trackers being built right around the world. And trust me, we’re not complaining.